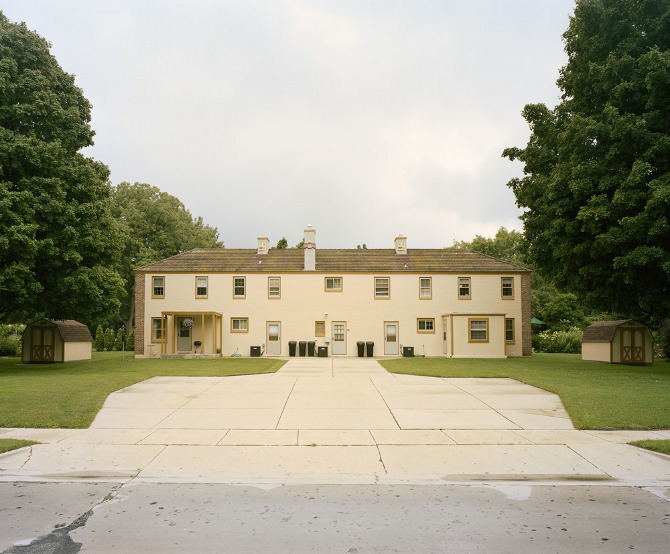 Falling under a similar overall theme, Jason Reblando’s two bodies of work “New Deal Utopias” and “Lathrop Homes” offer visual insight into the design of government idealized homes and communities within the United States. With a compelling stillness, his photos depict the original ideas of the spaces as well as the realities of day-to-day life. Abigail Smithson: Over the course of working on these two projects, what have you discovered about the relationship humans have with the space they call home? Jason Reblando: I’ve considered the concept of home very carefully while working on these projects. Lathrop Homes is a public housing development on the North Side of Chicago, and is in the process of being redeveloped by the Chicago Housing Authority. It was built during the 1930’s by the Public Works Administration. It’s very beautiful, but it has also seen better days. The CHA would like to replace the current buildings with mixed-income townhouses, while many of the remaining residents would like to preserve the buildings and maintain their affordable housing status. While some Lathrop residents have a strong connection to their neighbors and the buildings, there are some residents who were tired of being moved from unit to unit as the buildings were systematically shut down. They simply want a stable place to live whether it be Lathrop or not. Having moved around a few times myself, I feel like home is just as much a psychological state as it is bricks and mortar. If I don’t feel connected to the people or the environment around me, then I’m not sure I’d want to call it home. 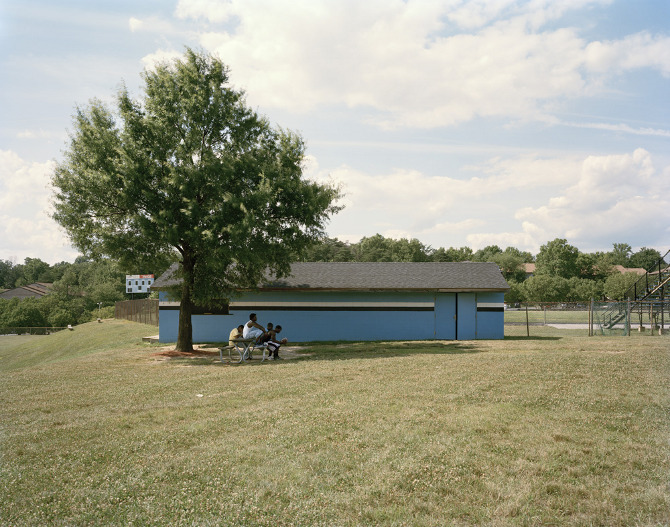 While making images for New Deal Utopias, I’ve found that the relationship that the residents of the Greenbelt Towns have with their communities just as compelling. The towns of Greenbelt, Maryland; Greendale, Wisconsin; and Greenhills, Ohio were built by the Resettlement Administration (RA), another New Deal agency, in the 1930s. They were built as planned communities by the government during the Great Depression, and the hope was that residents would meet the challenges of the Depression through cooperation, not individualism. This community sentiment, in large part, persists today. Residents are very invested not only in their own town, but in each other’s towns. Traveling from Maryland to Ohio to Wisconsin, I spoke with many residents who were acutely aware of their connection to each other through their New Deal legacy. In the last couple of years there has been a bus tour that leaves from Greendale, Wisconsin, then travels to Greenbelt, Maryland, and Greenhills, Ohio. I’m aware of international “Sister City” programs, but I think the way these particular towns relate to each other is very unique. It seems like they can relate to the concept of home on a whole other level. 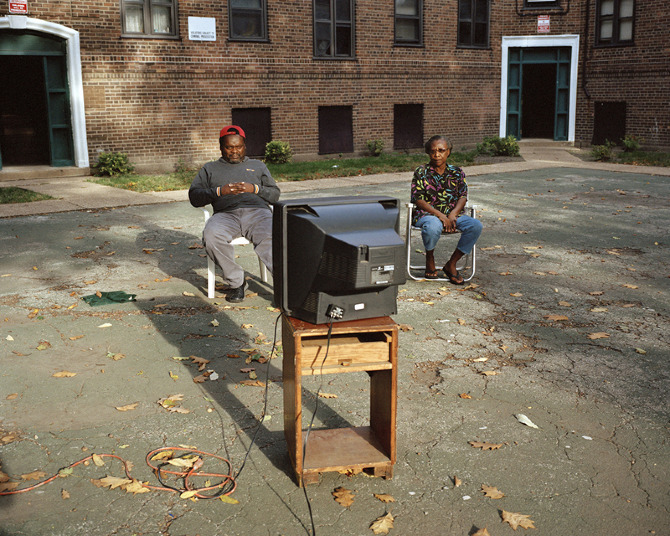 AS: How do your images reconsider the common understanding of public housing (or government involvement in housing)? What aspects of these communities are you trying to show that may not have been shown before? JR: I think that high-rise public housing structures have become symbols of dehumanization and societal neglect. While Lathrop Homes is considered a low-rise, it gets lumped in with Cabrini-Green, and Robert Taylor Homes, all high-rise complexes plagued with decades of violence. 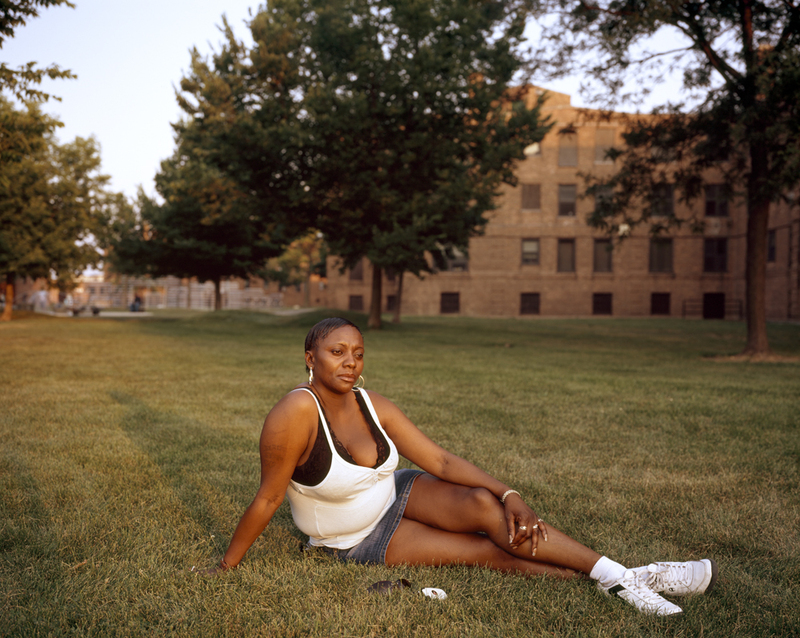 Lathrop Homes has an unseemly image merely because of its status as a public housing project. 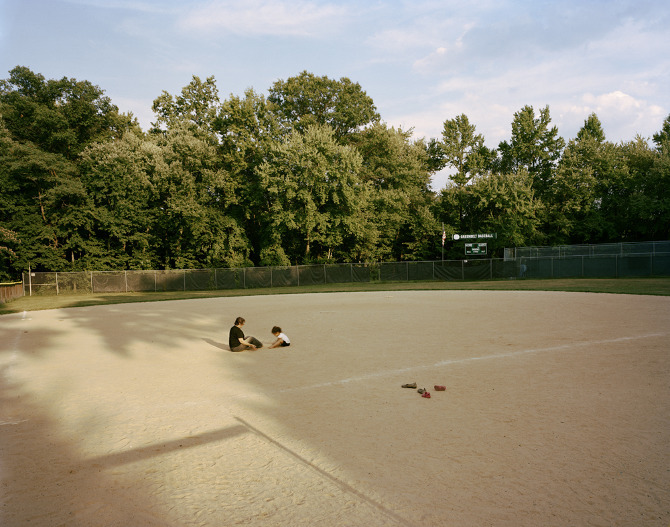 My goal with the Lathrop project was to reveal qualities that I thought were atypical of public housing – its humane scale and architecture, lush common green spaces, racially diverse residents. Driving by Lathrop, it’s easy to mistake it as a complex of vacant buildings. I wanted to show that there was indeed community that still calls it home. 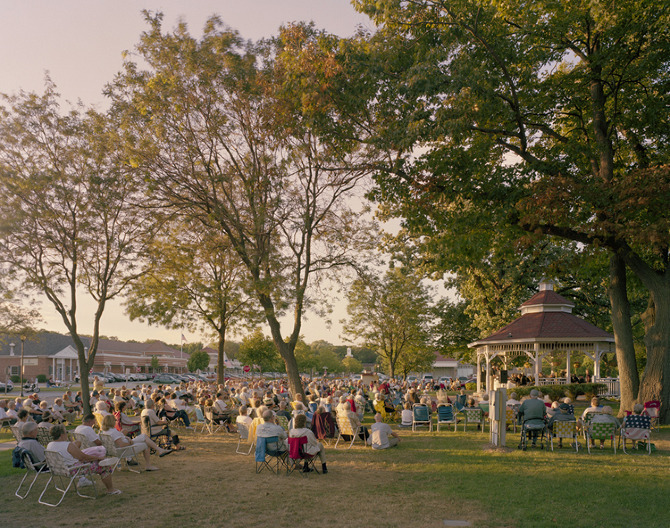 When I started photographing the Greenbelt Towns, my conceptual framework changed as I became more interested in architecture and social spaces. Early years of the towns were well-documented by the RA (which was eventually dissolved and folded into the Farm Security Administration) photographers. 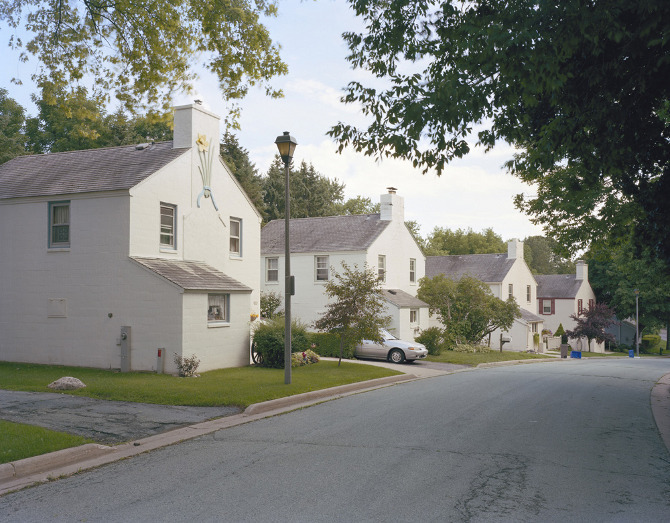 Those photographs documented the construction and the residents enjoying these model towns. 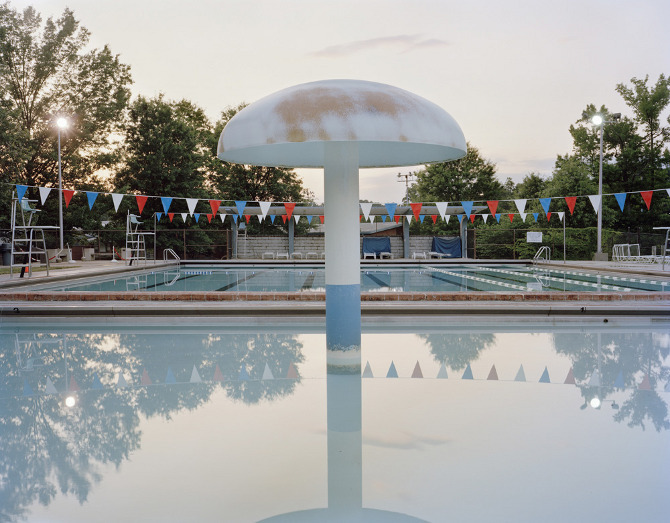 I’m fascinated with the utopian belief that architecture and landscape can shape the workings of a community, and hope my images will allow viewers to reconsider how they relate to planned or unplanned environments in which they work and live. AS: During the “Lathrop Homes” project, how did you gain access into the apartments? JR: I worked on this project for over two years and became a familiar face around the neighborhood. I wasn’t very hard to spot as I was working with either a view camera or a sizable handheld camera around my neck. I was always very transparent about why I was there. I told people I was in graduate school for photography and I was interested in what was happening with public housing around Chicago. I always carried a mini-portfolio of 5x7s with me, and gave residents photos when I ran into them again. I did work briefly as a community organizer after college, and I’m somewhat used to talking to strangers. I’m also used to getting rejected, but I do manage to persist somehow. One day, when I was photographing people outside the Lathrop Homes, it started to rain, and then I just followed the group in and asked if I could keep making photos. Once I had these pictures to show others, people started having me over for dinner. I was very grateful to have encountered such incredible generosity. AS: Specifically in the “New Deal Utopias” work, you have documented not only the people that live in these areas but the marks that have been left by them. Do you think that the physical marks we leave behind (buildings, pools or gazebos) are strong enough indicators of the past without needing the actual people as the main subject? JR: There was definitely a shift in how I wanted to approach the New Deal Utopias images, as opposed to the Lathrop Homes work. I was very focused on resident life while photographing at Lathrop, and it was a very concentrated effort because I was photographing the same four or five city blocks for two years. When I switched to the Greenbelt Towns, I zoomed out literally, geographically, and conceptually. I made portraits along the way, but I began to incorporate small figures in an otherwise large landscape image. I wanted to approach scenes the way an urban planner creates scale models. When I consider the physical marks in the images you mention, I’m engaging with indicators of the past the way an anthropologist would. 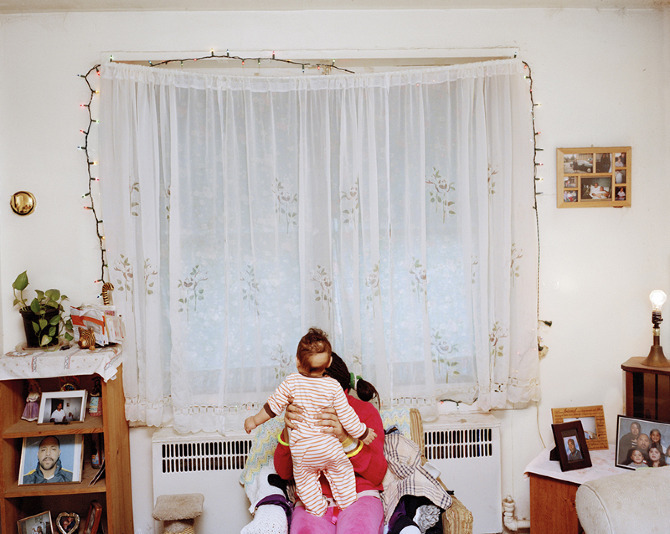 The photos are subtle portraits of a community, as I’m curious about what holds a community together. 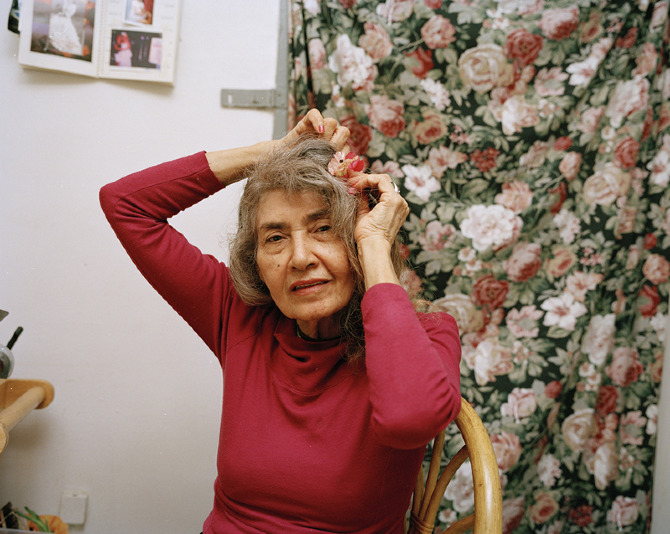 While many of the photos are vacant, I do still consider the project to be about people. AS: Do you have a preference between shooting landscape scenes and shooting portraits? Do you think one is more telling than the other? JR: I go through phases, though my choices are usually driven by the project. I don’t think landscapes are any more or less telling than portraits. I think the context in which a photo is made is probably the most revealing and exciting thing about photography. AS: In the midst of these clearly man-made environments your photographs hold an isolated stillness that leads to a feeling of dystopia. Was this a feeling that you tapped into while shooting in these areas? JR: I’m glad you asked this. I do hope to evoke a tension between the ideal and real. While utopia strives for equality and perfection, it will of course always fall short, as its etymology can imply. “Eutopia” means good place, and “utopia” means no place. As every utopian plan attempts to bring order to chaos, it must start with a clean slate. There are winners and losers, despite the efforts to achieve equality. One person’s utopia can be another’s dystopia. One person can be perfectly at peace being alone, and it can lead to another person’s exile. I hope to leave a degree of ambiguity and open-endedness to the images. AS: What do you think is the biggest difference between the “Greenbelt Communities” and other modern American suburbs? JR: On the surface, the size of most modern suburbs dwarfs the Greenbelt towns. The RA planners wanted the towns to be walkable, with plenty of common green spaces to encourage neighborly interaction. The actual “greenbelt” refers to a circle of parks and forestland that surrounds each community. This greenbelt acts not only as a natural boundary between the town and larger urban areas, but also prevents the town from sprawling outwards. While each town has had varied levels of success in maintaining their greenbelts, there has been a renewal of interest in the design elements of these towns. 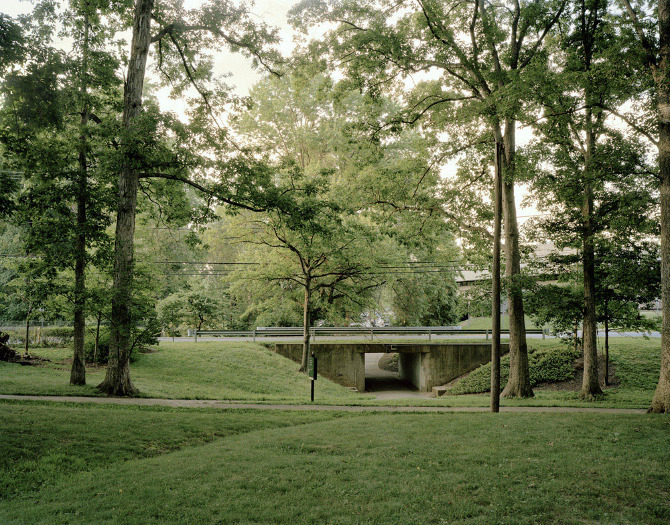 New Urbanists who want to solve problems of modern suburban sprawl aim for a humane mix of commercial and residential properties, just as the architects of the Greenbelt towns did almost eighty years ago. The towns also have a distinct architectural style. They were built as modest houses for modest times. It seems like the large McMansion is de rigueur in the gated communities built in the last couple of decades. As many people have their personal reasons to live in a gated community, so do many who choose to live in Greenbelt towns. Living in a Greenbelt community is almost like a philosophy or a life choice. They feel very connected to and invested in why and how the towns were created. AS: Is there a fine art aspect to your work or do you think it falls into the documentary category? JR: For my own work, I don’t think it’s an either/or proposition. I think there is an enormous amount of overlap in the Venn diagram of fine art photography and documentary photography. I borrow from Walker Evans when I say that these photos have a “documentary style.” A document should by and large be objective, and I understand how photography often functions as a recording device to most of the world. While I am interested in the thing itself, I also hope that my images call attention to and complicate perceptions of the object being recorded. 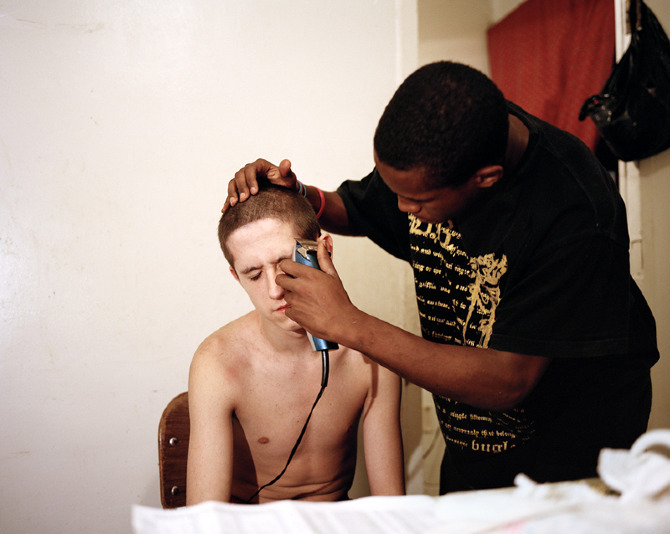 Jason Reblando is a Chicago based photographer. See more of his work here.